Unique Art Show in San Diego: Fluid Art by Gary Bell and Jeffrey Taylor - Live. Laugh. Learn. Are you looking for a new work of art to brighten up your office? Do you want to collect or commission a one-of-a-kind piece from an up and coming local artist? On this episode of Live, Laugh and Learn With Chris, we’re introducing you to Artplay® by San Diego painter Gary Bell. This poet-turned-painter’s love of bright colors and textures has translated into the most amazing paintings, with an upcoming art show you won’t want to miss! Gary’s painting career happened, essentially, by accident: his first creative outlet was poetry, but he faced an obstacle when the words stopped coming to him. Since he was still in need of a form of expression, his counselor advised him to investigate painting. Gary was skeptical—he had tried his hand at art before and felt unskilled—but his counselor recommended a no-stress, no-expectation process to overcome his hesitation. Willing to give it a go, the painting supplies were purchased and Gary headed home to see what the results would be. The experience proved to be impactful, as the joy of creating without judgment and criticism was what Gary had been craving. There was fun and freedom in putting color to canvas without overthinking the results, and Gary discovered it was also the perfect outlet to express his creativity. From that first painting, Artplay® was born, Gary’s brand of bold, textured abstract art that plays heavily on bright colors. As a tactile person himself, Gary’s paintings feature thick, varied acrylic textures that lend a 3-dimensional feel to his work. His art is more than just something to look at; it’s something to experience and touch. Art connoisseurs are drawn to this intriguing aspect of his work, something that Gary did not expect but feels grateful for. He loves talking about his art, discovering how it touches and moves other people in unexpected ways. Through commissions, Gary also creates unique pieces of art for each client’s taste and mood, resulting in some amazing works that will be sure to inspire and beautiful any space. If you’d like a chance to get a closer look at these textured, vibrant paintings, be sure to give me a call so I can personally connect you with Gary Bell and his Artplay®. 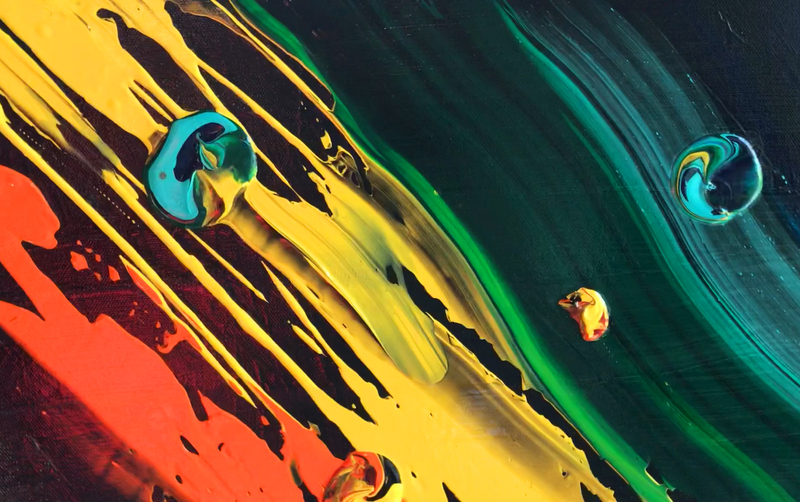 You’ll also want to be sure to check out his upcoming show at About Face Salon on April 7th; titled “Fluid Art,” this collection features pieces using elements of fluid-acrylic medium that will inspire and move you in ways you’d never expect. I hope to see you there!